Dubai: Energy drinks like Red Bull and Monster, once a popular choice for students, have seen sales plummet in the UAE since the introduction of a 100 per cent Excise Tax, which doubled their retail price overnight. Dubbed a “sin tax” by local media, the duty also doubled the price of tobacco products when it was introduced in October 2017, and increased the cost of carbonated soft drinks, such as Coca-Cola and Pepsi, by 50 per cent. Arriving just three months before a 5 per cent Value Added Tax (VAT) came in to effect, the Excise Tax was intended to boost state revenues and to modify consumer behaviour in light of soaring diabetes rates, officials said. Now, research from London-based Euromonitor International suggests that energy drink companies in the UAE have seen sales drop by as much as 65 per cent in the 15 months since the tax was introduced. 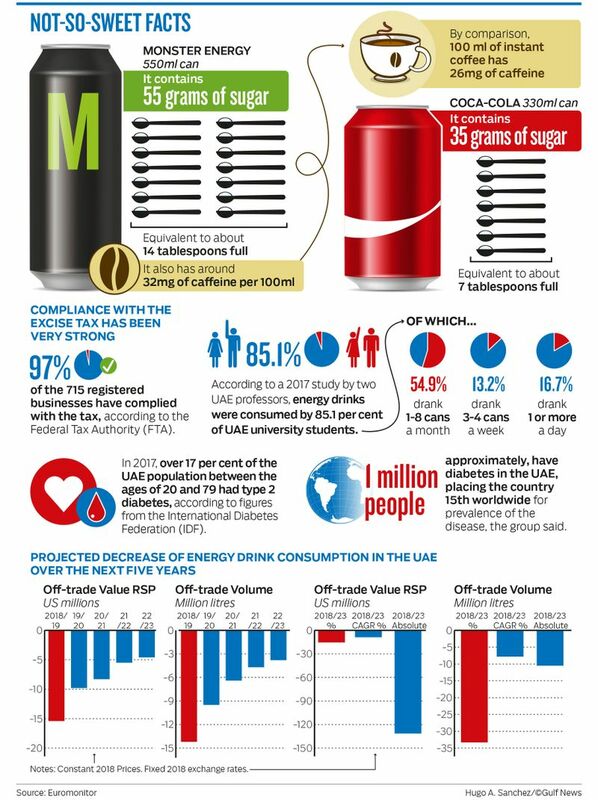 “We’ve seen massive reductions in the consumption [of energy drinks],” said James George, a consultant at Euromonitor specialising in the drinks market, in an interview with Gulf News. The GCC in general has always been of the position that the overconsumption of certain products ... has a detrimental effect on the larger populace, if it’s not properly regulated. Governments in the region have been forthright in educating consumers on the potentially harmful effects of energy drinks, which typically have high sugar and caffeine contents, in addition to taurine and other chemicals. In a 2017 study of Emirati university students, it was found that energy drinks were consumed by 85.1 per cent of respondents, with over 16 per cent of students drinking one or more a day. Popular energy drink companies such as Power Horse, Red Bull, and Vitaene C have enjoyed rapid growth throughout the region in recent years as a result of this demand for their products. Raj Chumber, a director at Titan, a Dubai-based energy drinks brand, said that his company had been part of that unabated growth, up until October 2017. “Did we see an impact from Excise Tax? Yes. A big one,” Chumber said in a phone interview. At Dh5 for a 250 millilitre (ml) can, the executive said that his product was still relatively cheap. After the 100 per cent tax hike came in to effect, a 250ml Red Bull Energy Drink now costs Dh9.95. “The sales are not too bad, but we’ve had to condense the operation,” he added. According to Chumber, price hikes on consumer goods in the UAE have a greater impact on consumption than in a wealthier market such as the UK. And more bad news may be on the way for energy drink producers: Euromonitor estimates that the market’s value will decline by a further 39 per cent in absolute terms between 2018 and 2023. “When taxes of this nature come into effect, anywhere in the world, the question is how does the regulation of energy drinks impact consumer choice,” said George, the Euromonitor consultant. Unlike the tobacco market, which saw heavy downtrading in the months following the introduction of the Excise Tax, with consumers swapping more premium, expensive brands for cheaper, lower-end ones, energy drinks didn’t witness this phenomenon when they sharply increased in price. “The biggest consequence [of the tax] was the reduction of all consumption,” George said. For Hassan Bayrakdar, a Dubai-based food and beverage regulatory expert, this shift was to be expected: “It’s normal when you double the price of a good, consumption will be less,” he said. As for carbonated soft drinks, Bayrakdar previously told Gulf News in 2017 that the relatively small increase in price would only discourage a percentage of the lowest income segment of society. Redbull, Coca-Cola, and Pepsi all declined to comment for this article. There has been widespread compliance with the levy from retailers and distributors, according to the Federal Tax Authority (FTA). Over 97 per cent of the 715 registered businesses submitted their tax returns, the FTA announced in October 2018, leading to a reduction in smoking — and the consumption of energy drinks. “The GCC in general has always been of the position that the overconsumption of certain products...have a detrimental effect on the larger populous if they're not properly regulated,” said George. As such, a combination of education and pricing has been deployed by the government to disabuse people of their potentially harmful habits. The results are evident: According to Euromonitor data, the size of the energy drinks market will shrink from $356 million (Dh1.3 billion) this year, to $224 million in 2023. In terms of volume, while 2018 saw 31 million litres of product purchased, Euromonitor estimates that figure will decline by 11 million litres over the next five years. But the energy drink companies are responding to the decline with new products. The shelves of supermarkets and grocery stores up and down the country now stock products that market themselves as more healthy, or more natural, than their predecessors. “This is to form newer, more viable energy drinks. There’s an evolution happening.” That said, sugary, caffeinated energy drinks remain the norm, and they are still hurting, according to George, while healthy variants continue to make up only a small proportion of total market sales. And of course, there will always be a need for caffeine. Whether young people increasingly migrate to coffee-based drinks, which remains largely untouched by regulation, despite containing large amounts of sugar and caffeine in many cases, or continue to consume energy drinks, the need for stimulation in one form or another will never cease. “It’s a cycle, and what is retailing at Dh14 now, is something that will become commonplace two years from now,” George said. New people coming in to the category would consider it the norm, he added. In tandem, drinks manufacturers would reformulate their products to adapt to changing demands, and present a refreshed offering to appeal to a new generation. In the UK, following the introduction of a sugary drinks tax there, producers slashed their sugar contents by up to 50 per cent in order to fall below the taxable threshold. “We’ve always seen volumes return, and there will be an evolution following the price shock,” said George. “But people will always need caffeine,” he added.